During my book talks, I always brag -- and rightfully so! 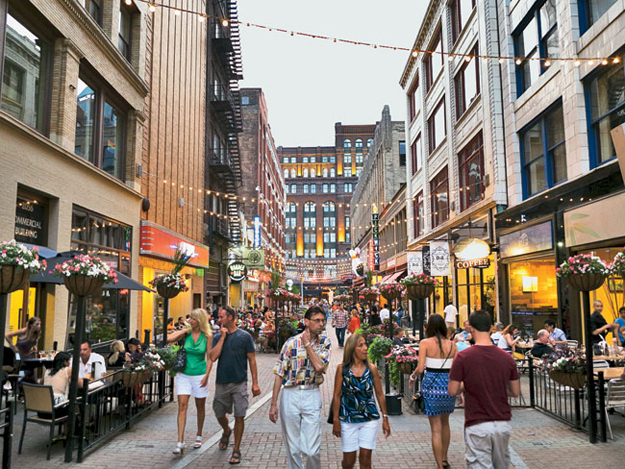 -- that Cleveland has indeed evolved into a hot foodie tourist destination. Out-of-towners are either traveling specifically to our city for a culinary adventure or stopping here purposely on their way to someplace else in order to experience our gastro delights. These travelers are the same people who have read about our top-rated restaurants in national magazines or newspapers or blogs...seen one of our high-profile chefs on TV...or heard about our rising food scene on the radio. However, after one of my book talks a few weeks ago, a person in the audience asked me to support this claim. So...here you go, folks! The Brooklyn Nomad - Blogger and world traveler, Andrew Hickey, includes Cleveland on his selective list of "Best U.S. Foodie Destinations." Chicago Tribune - Reporter Monica Eng sings the praises of Cleveland's dining scene after a weekend with Michael Ruhlman. Pittsburgh Post-Gazette - Reporter Gretchen McKay boasts about Cleveland being a "growing foodie destination" -- much more so than Pittsburgh. Rah Cha Chow - Blogger, food writer, and cooking contester from Rochester, Tracy Schuhmacher, extols the virtues of a day spent in this foodie city. The Vacation Gals - Three professional travel writers tout Cleveland as THE place to visit for a great dining experience. Travel+Leisure - This respected magazine lists Cleveland as #4 on their "Best Farmers' Markets" list. They also listed Pier W as one of the "America's Most Romantic Restaurants" and Sokolowski's University Inn as one of the "Best Places to Eat Like a Local." Many more listings would require a lot more space. Esquire - Revered food critic, John Mariani, placed L'Albatros on this magazine's list of the "Best New Restaurants." Other kudos are also included. NPR - One of Ideastream's shows, "The Sound of Ideas," focused entirely on Northeast Ohio as a true dining destination. Food & Wine - This epicurean tome showcases the best Cleveland has to offer the nation. AOL Travel - These experts know their stuff, and they're more than happy to highlight the culinary gems travelers will find in our great city. If you know of any other mentions you'd like to add, please leave a comment below! Thanks for this impressive list and all of your work in promoting this delicious city of ours. Clevelanders should all be very proud! I know I am. Nice to hear from you, Charlene. Wow, you really know how to do your research! Thanks for the list (and websites)!